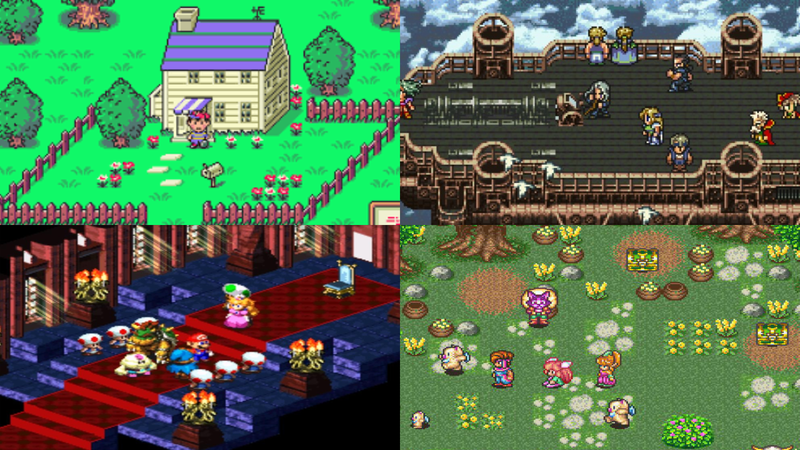 Which SNES JRPG Should I Play For The First Time? I’m new to the gaming scene. Like, really new. I grew up with the GameCube and DS, and aside from Spider-Man 2 and Mario Kart DS, I mainly played mediocre to horrible movie tie-in games. Then, when we got a Wii, Xbox 360, and PlayStation 3, I played more movie tie-ins for a while before trying out a little series called The Legend of Zelda. That’s when I really started to become the gamer I am today, when I was around 13 years old, about five years ago. So, as someone who’s been gaming seriously for about five years, about the length of a console generation, I often get yelled at by well-meaning people about what games I haven’t yet played. Sorry guys, but I haven’t played Super Mario 64 or Super Mario Bros. 3, nor have I played any Final Fantasy but XV, or any DKC or Metroid game. Even as a self-proclaimed Zelda fanatic, I haven’t beaten any of the GameBoy Zeldas, from Link’s Awakening to The Minish Cap. I fully intend to, but I’ve been trying to keep up with around 30 years’ worth of games over five years while new and exciting games are still coming out, while a lot (not all) of people telling me to play all of these games have been with them since very close to the beginning. But I’m still trying to keep up, and this is my next attempt. I’m out of state for the next month, and thus I didn’t have the space to bring my PS4, but my tiny little SNES Classic fit just fine. And so, I’m letting you pick out one meaty, beloved JRPG for me to play all the way through and report on later. And here’s a very fitting anecdote to make this all come together: I was talking to my dad and stepmom about the four games I was considering playing, and when I got to Secret of Mana, one waiter walking by stopped everything and started shouting about how it’s one of his favorite games and how fantastic it is. He was preventing this one poor guy from getting his breakfast just so he could try and convince me to play the game!